We are well and truly into spring now which for me is another time of the year that I love because you can still ever so slightly get away with wearing a jumper and not look like a crazy lady. So whilst having a massive wardrobe clear out of old clothes that I no longer wear or like, It reminded me that I needed to have a little refresh of my wardrobe and add a few more springy items. So I hit the shops on a few occasions and thought I'd now share with you some of the things that I've bought. Note I didn't buy all of this in one go........and most of it is from Topshop. The first thing I bought was this rather slouchy sweater from Topshop it's just a plain black sweater with this really soft fleece feel to it. Topshop always seem to come up with items that are not only comfy but suitable for all occasions! It's perfect just to throw on and goes with either leggings, jeans whatever it has a bit of a high neck to it and batwing sleeves so it adds to more of a slouch fit, I love that it says "Sweet Life" on left side too. 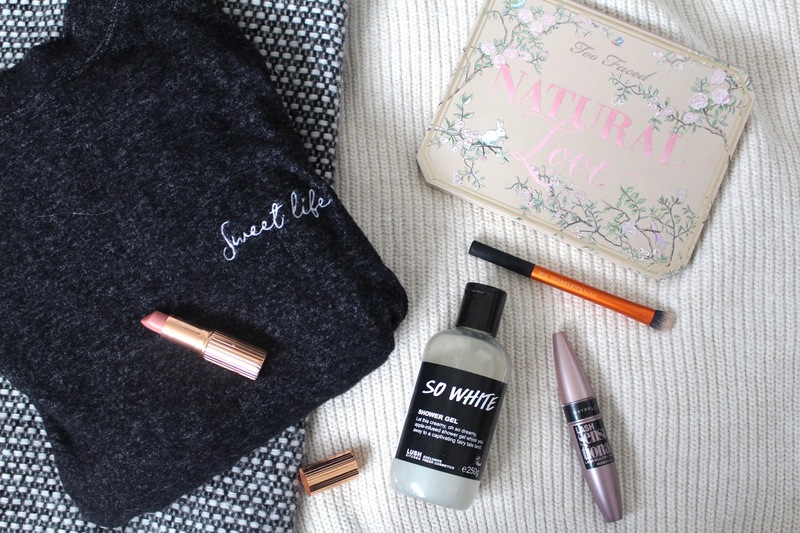 You will notice I've gone a bit mad on jumpers recently & did end up featuring this in my april favourites. Whilst also in topshop I bought a pair of light blue mom jeans, I've wanted a pair of mom jeans for SO long as I keep seeing people rocking them all over instagram, the ones I've got are the bleached out mom jeans, I love them, I'm not a huge jeans wearer as I much prefer leggings or the american apparel ponte disco pants. but these are really comfortable and feel slouchy and look so good with basic tops and the body that I've bought. This is the body I absolutely love this and have worn it numerous times already it's very comfortable but my favourite part is the giant bow that's on the back it's just so pretty I thought, this body with my mom jeans & either flats or converse would be such a cute outfit one in which i'm going to do a little look on in a future post. 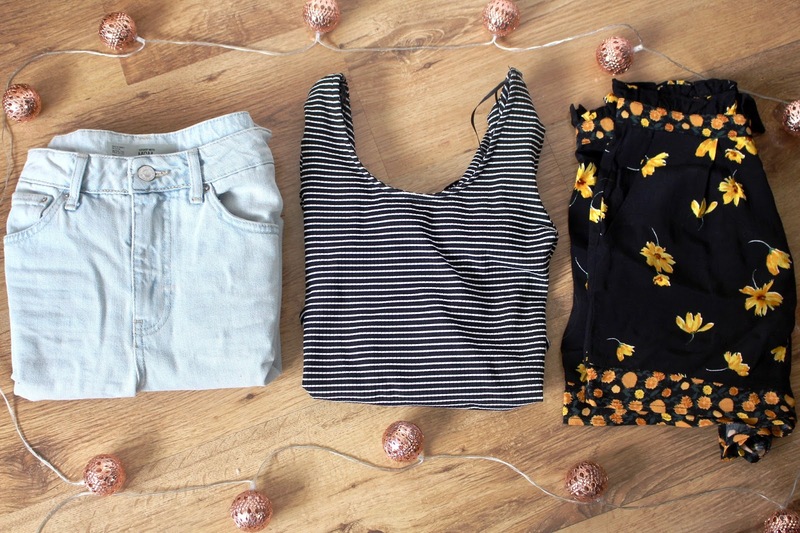 We like short shorts.........I seem to have fallen in love with shorts at the moment and two pairs that I picked up from Topshop are just so comfortable and go with a lot of basic tops. First pair are these gingham ones with little frills, I adore these again I can wear these when the weather warms up, with a little black or white top & some cute shoes. The other shorts I just loved instantly and had to go and buy, they are just plain black but have these yellow (they look like) daffodils on them, you have this little button to fasten them, they were just too pretty to put down. Again you can wear them with just a black top, sandals, floppy hat and bang another outfit right there. Moving on from Topshop now I popped into H&M and bought this three quarter length sleeve dark grey top, I have this exact top already in black but wanted to see if I could grab another colour and I do love my greys. I find that H&M clothing lasts a really long time and the black version of this top I've worn endless times. Really comfortable and goes with everything. I decided to stop there as I felt like I only need a few bits and pieces. I actually love collecting everything that I’ve loved through out each month and begin to sit down & start typing away about it, so today I thought I’d share with you all my April Favourites. The first thing that is something rather new and exciting from Real Techniques is their Concealer Brush, I talked about this in a previous post back here and said how much I’m loving this brush, it’s so good and you can quite precisely blend your concealer with it, either under the eyes or on blemishes it’s brilliant. 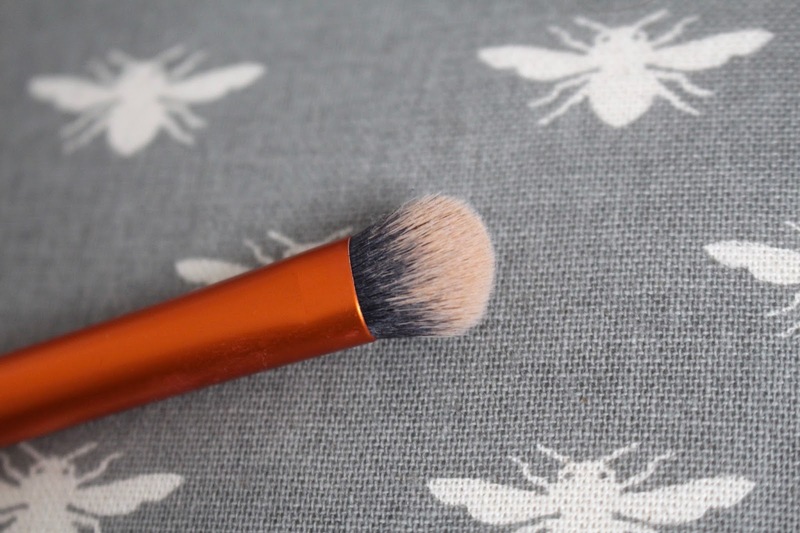 When it comes to highstreet budget friendly brushes Real Techniques have got it spot on, as they are all really high quality brushes but aren’t at a ridiculous price. Next up is one mascara that I would recommend to anyone! It’s the Maybeline Lash Sensation Mascara, I have gone through countless bottles of this mascara and that’s for a very good reason, it really lengths and makes your eyelashes look incredible I love how it comes just under the £10 mark and it’s really easy to get hold of, It doesn’t go clumpy and it makes your eyelashes look really natural and volumized. It’s just a really fantastic highstreet mascara that’s very very affordable. If my friends ever ask me “what’s one highstreet mascara that you’d recommend?” 9 times out of 10 I’d say this one. I just love it. Lush wise I’ve become obsessed again either with a bath bomb, facemask or my beloved Scrubee………but one thing that I’ve been loving using this month is the Lush So White Shower Gel, I bought this a while back from the Lush Kitchen and it’s my all time favourite lush smell, this and either bubbly Shower Gel or Plum Rain are my go too. It smells exactly like apples and has worked wonders on my sensitive skin. 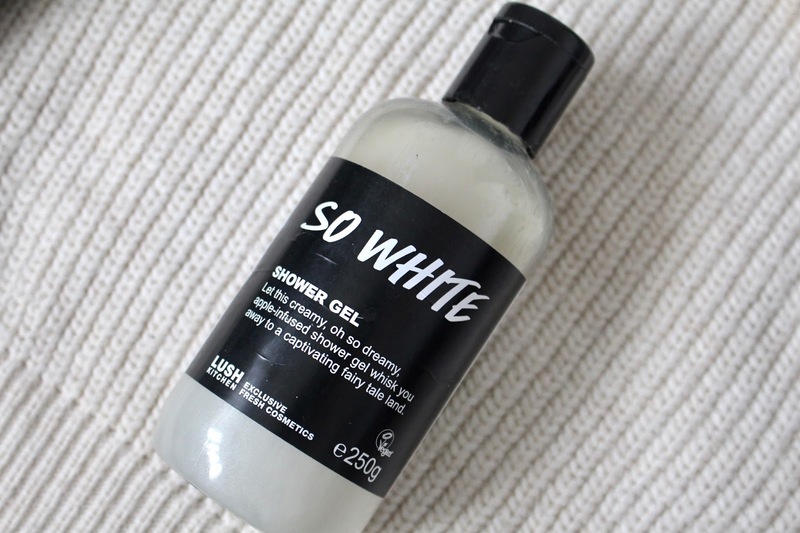 It foams up really nicely and feels extremely gentle on my skin, if you are wanting a shower gel that not only you can smell all day but that feels nice I’d really recommend you take a look into lush shower gels, all be it a little bit more pricey, they are a lot more natural than other highstreet products and smell incredible. 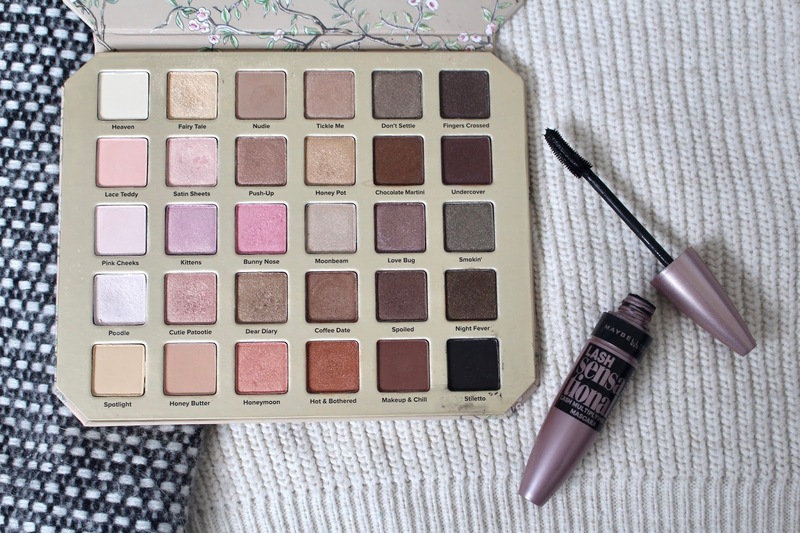 Too Faced Natural Love Palette, is one palette that I have been reaching for non stop. I did a review on this and went into a little more detail about it here, but it’s honestly the most beautiful collection of eyeshadows I have ever seen, they are all very creamy, easy to blend and all have great colour pay off. 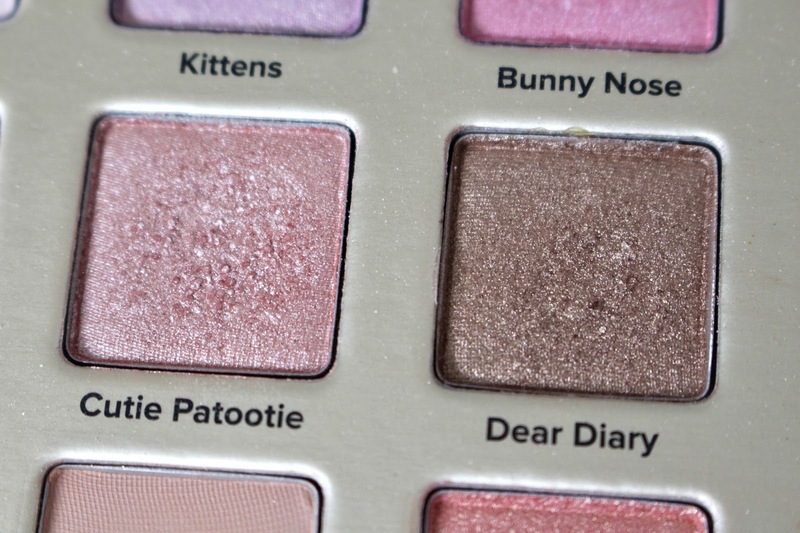 I particularly love a combo of Cutie Patootie & Dear Diary with a hint of either poodle or fairy tale in the inner corners of my eye. You can actually purchase this now here in the UK from Selfridges and it’s honestly completely worth the money I’ve used this palette everyday for the last month. 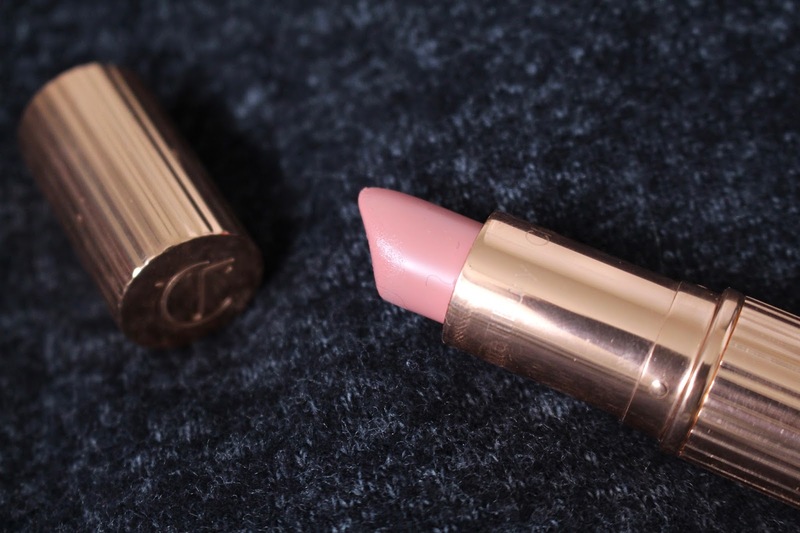 Lipwise I’ve loved loved loved using my Charlotte Tilbury Valentines Lipstick, it’s another product that I’ve used everyday for the past month & yet it barely looks like I’ve used it, it’s a gorgeous pretty rosy pink that feels very moisturising and non drying on my lips. This lippy is limited edition so if you can get your hands on one then do, it goes with lots of my makeup looks and is another one of them products that all my friends ask me what am I wearing on my lips. 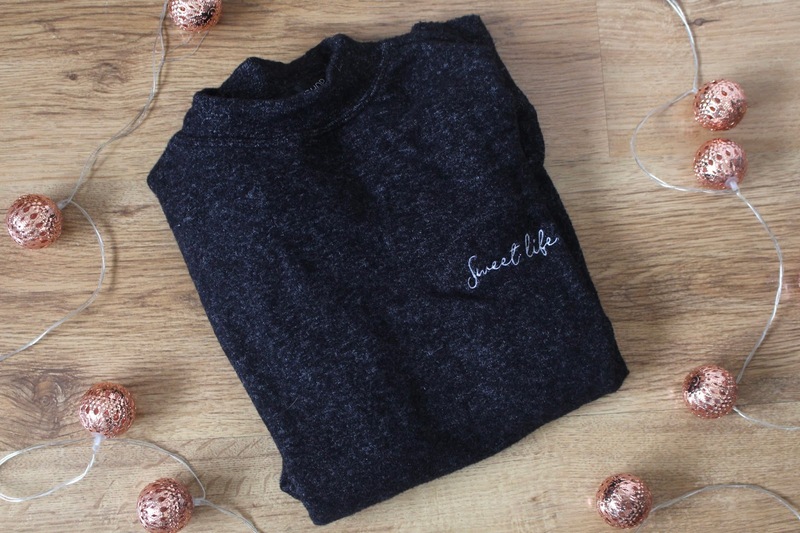 Non beauty & makeup related but I’ve been practically living in this Sweet Life Jumper from Topshop it’s a very slouchy plain black jumper that I bought recently and I just can’t seem to stop wearing it, I just love how soft and snug it is on. And that my internet friends is everything that I’ve loved this wonderful April. What have you loved throughout April? Decluttering and rifling through my makeup collection once in a while is 1. a must but more importantly 2. satisfying....... I am a massive makeup junkie and every once in a while I tend to do a huge ransack of my makeup draws and decide what I'm going to keep, get rid of, give to friends & family & a pile of "need to use". So I thought I would share with you just how easy it is to go through what can sometimes be a never ending box of faces. 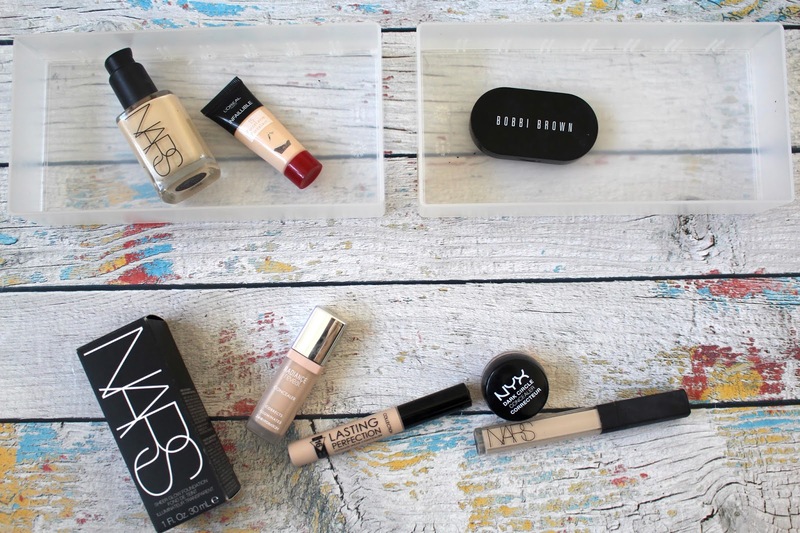 So here are my tips and tricks for decluttering your makeup collection. My plastic trays are from Muji. 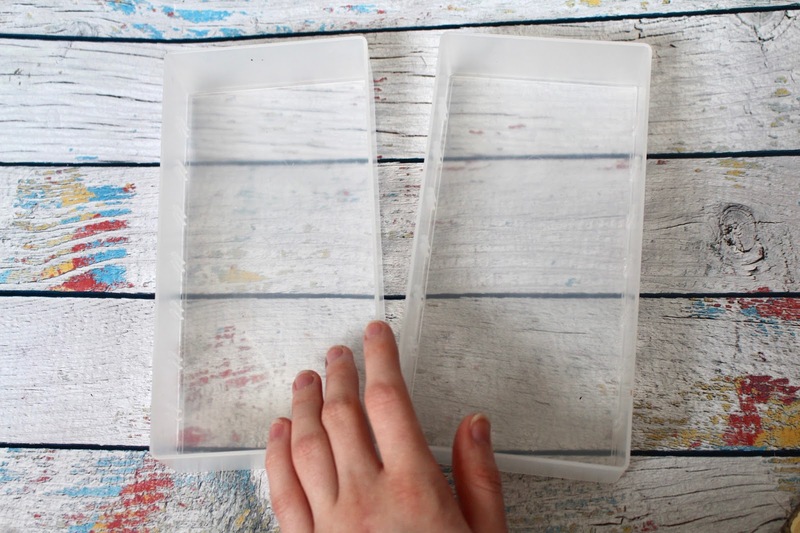 I use these to divide all my makeup and separate various different makeup items, simply grab two trays and a good amount of floor space. 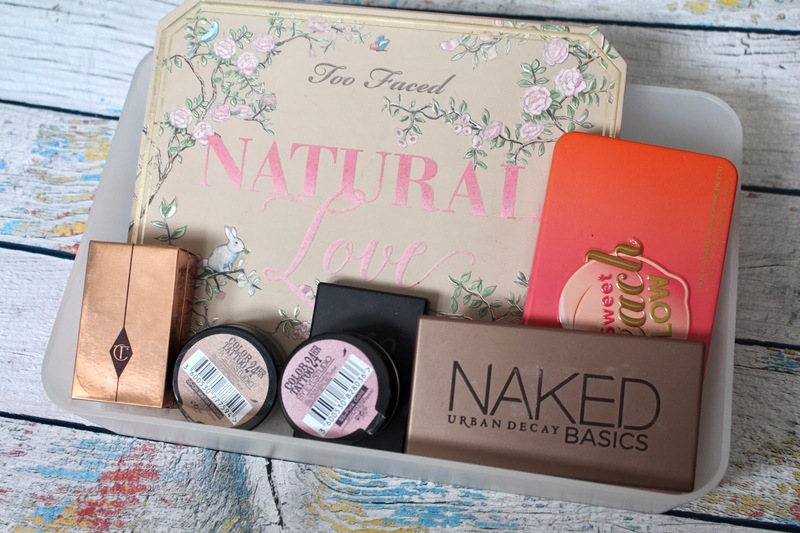 I then grab a makeup draw one at a time and work my way through each draw for example my foundations & concealers draw I go through each item and ask myself a few questions. How old is it? THE MOST IMPORTANT QUESTION.....no one should use extremely old makeup. Does it actually look good and suit me? Along with various other questions, which all end up narrowing down my collection I simply go through each item and pop the ones that are old or used up in one tray and have the other tray as a give away tray for friends or family. The ones with no tray and that are right at the bottom are the ones I'm keeping and will be popped back into my makeup draws. As you can see the tray on the left - Both foundations have run out or are extremely old and have since been replaced. The right hand side is either going to go to friends or family as it's either not working for me, doesn't match my skintone or I simply think someone else might love it and use it that little bit more than me. This makes everything SO much easier and less daunting. If you surround yourself in a swarm of makeup it can easily become overwhelming to the point where you don't even know where to begin. And there you have it it narrows it down each time I do this. 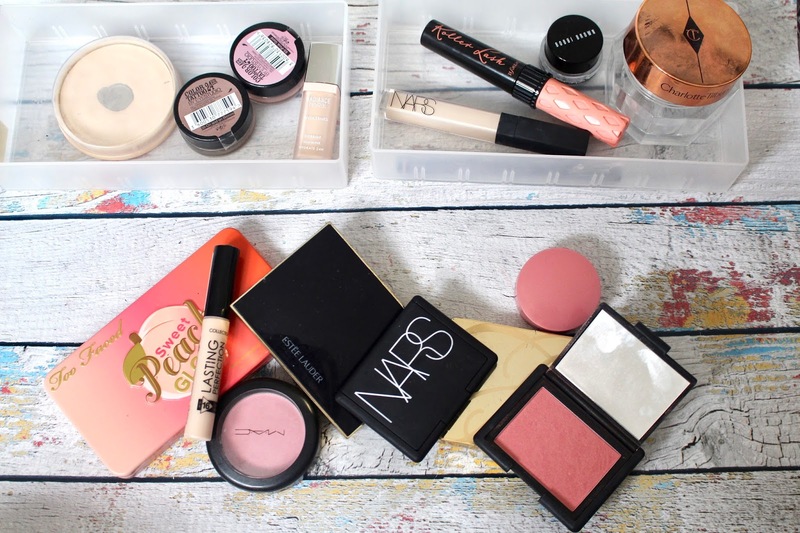 Powder products like blushers, eyeshadows ect. I feel that powder products do tend to last longer than cream products so blushers and eyeshadows I don't really keep an eye on dates wise I mean if it's well over 3 years old then by all means get rid of it but if it's a 1 year to 2 years old or if you are just keeping it because it reminds you of something or it was your first ever blusher or eyeshadow then by all means keep it. Honestly once you do this to every draw it becomes a lot easier to select and find the products that you actually want and use. 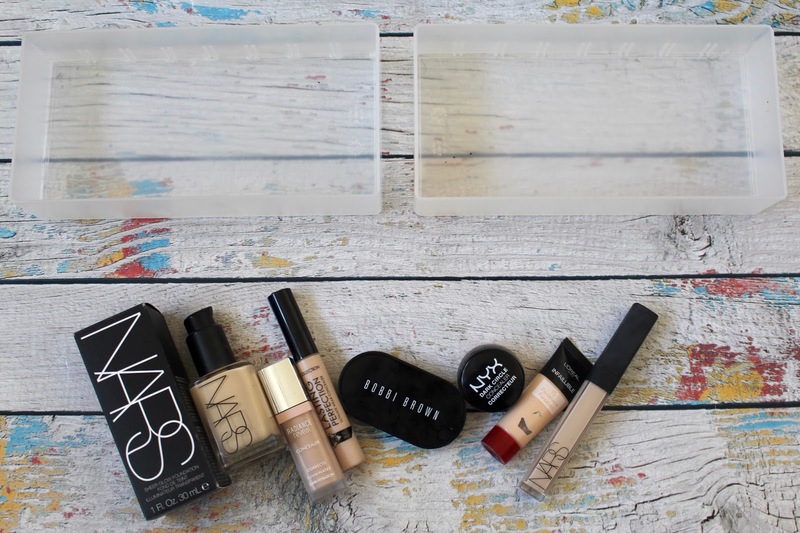 I also like to make a tray of the products that I need to use or keep using this again is another step that I find extremely useful. So what you waiting for? Go and cut the clutter. I thought I would share with you all my current everyday makeup look it's quite simple and quite a spring look without being too intense and very much a natural as possible look. For me there is something about looking into someone else's makeup bag that I find fascinating & intriguing as you can see what products they've loved and for me it gives me a glimpse to a persons personality and the things they love. I'll be honest here and say I'm one of these girls that just needs to constantly rotate which products I use as I'm always ending up getting into the same routine with certain products which don't get me wrong is wonderful as it means I become obsessed with them but sometimes I find myself missing out on little gems such as the ones above. I've been loving a very natural eye look & I've used something thats got little speckles of sparkles and shows up in natural light beautifully but isn't heavy or ott. I feel like when I switch around my makeup items it not only makes me feel happy but it makes me feel fresh faced and not the same old looks. So anyway these are the current products that are in my everyday makeup bag & the products I used to create the look above. Foundation - Nars Sheerglow in Siberia - Honestly the most beautiful foundation to have ever been made. Brows - Charlotte Tilbury Legendary Brows in Linda - Been loving using this slightly tinted brow product it's perfect for grab each and every individual eyebrow hair. Mascara - Benefit They're Real Mascara - One of my all time faves that I have for some reason in tiny travel size. 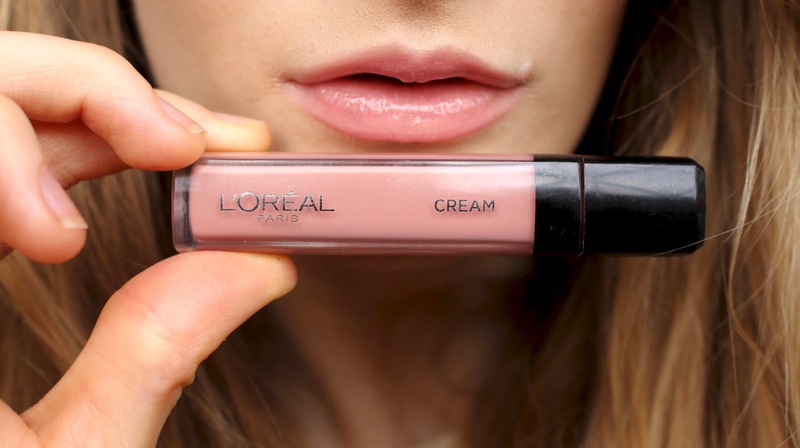 Lip Stick - Mac Angel - A beautiful soft pink. 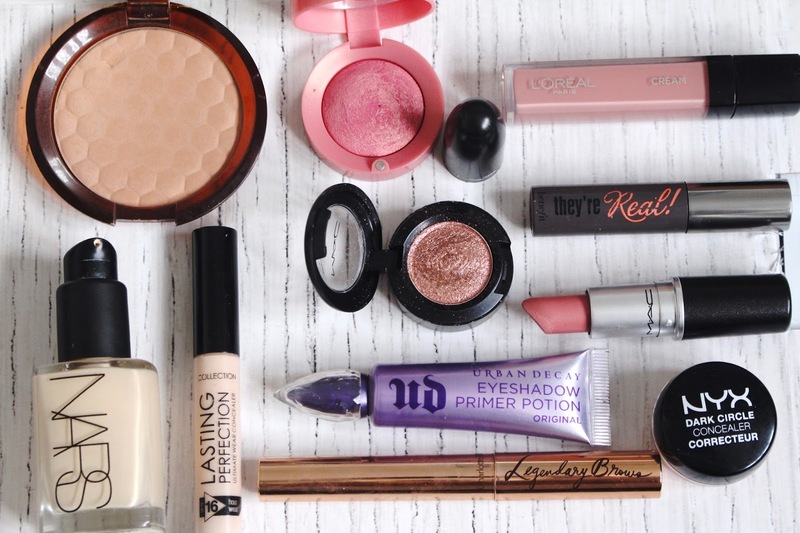 That's everything that's in my current makeup bag. I flipping loved March one because it was my b-day and two because I've used a whole array of products and fallen in love with some ones too. 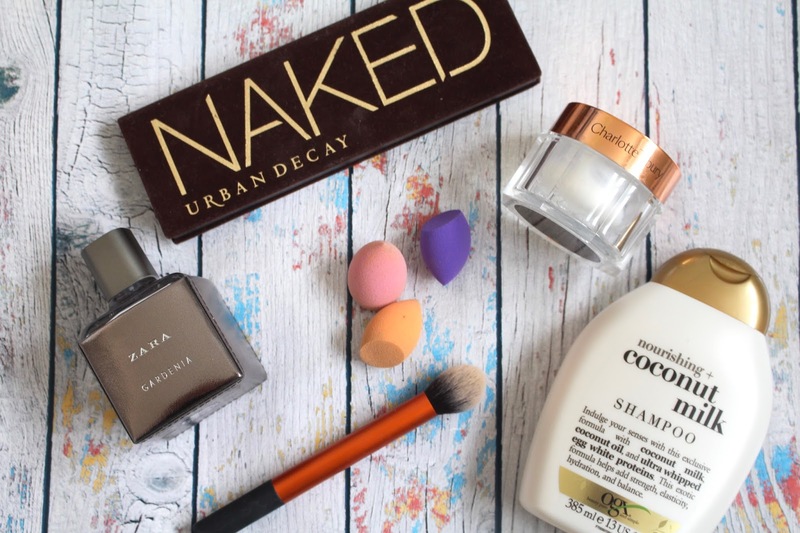 Today I wanted to share with you all my March favourites as who doesn't love a favourites post? 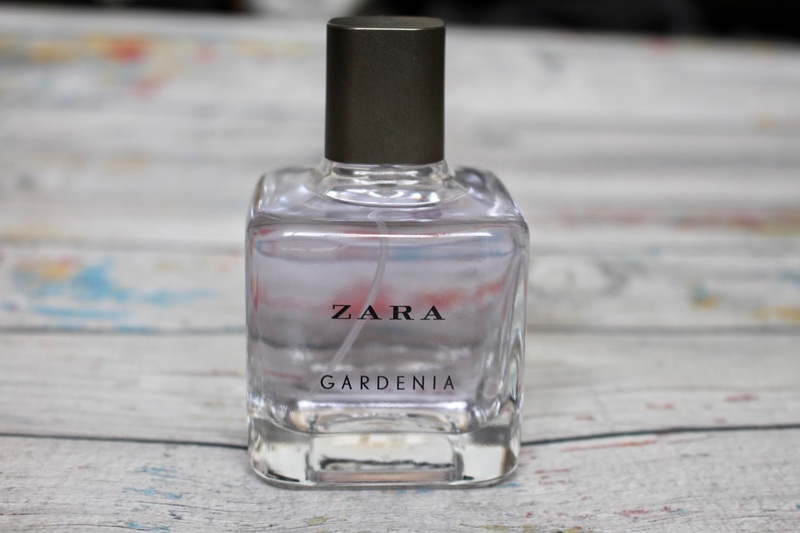 The first product I've been loving recently is a perfume by Zara, on a recent trip to Meadowhall I decided to buy far to many things in Zara and one of them items was this perfume, it's the Gardenia fragrance and I picked this up because it smelt exactly like YSL Black Opium which I love and this is practically the same scent but at a much more budget and highstreet friendly price, if you are like me and love a good quality fragrance but don't want to spend the earth for one, then this one I'd very highly recommend it's earthy but has definitely got a slight floral side to it. 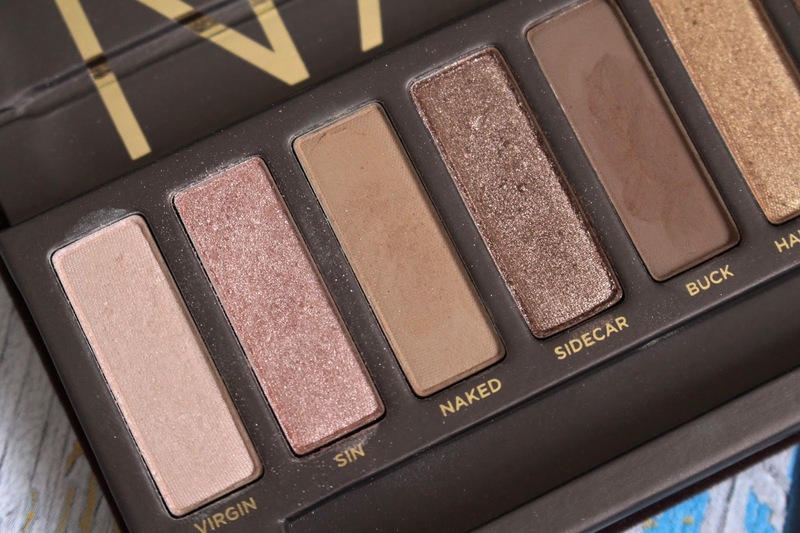 Next thing I've been loving is an oldie but a goodie, its the original Urban Decay Naked Palette, this is my favourite Naked palette because it's just so beautiful and the one that I've gotten the most use out of, I've been using this almost everyday throughout March, Urban Decay do the best eyeshadows and are one of my all time favourite beauty brands, my particular favourite shades from this palette are Sin, Sidecar & Buck I of course love Half Baked and the others but these are the ones that I tend to use the most at the moment. If you don't own a Naked palette trust me you are missing out. 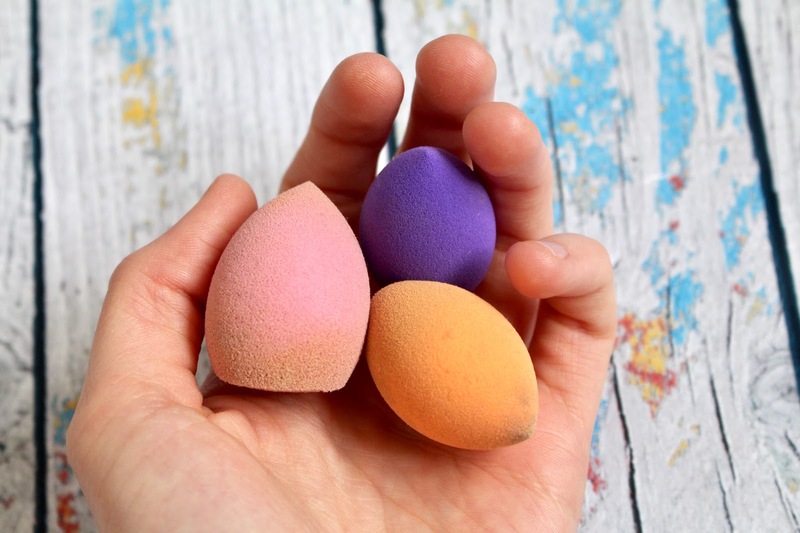 I'm a huge fan of the Real Techniques Beauty Blending Sponge and use it all the time, however I recently came across these tiny beauty blenders whilst out shopping with my friend and thought they'd be perfect for blending in concealer underneath my eyes and on troublesome spots, and honestly they are fantastic, they are so small and tiny which makes them perfect for getting right into the corners of my eyes and patting in my concealer, I've just been loving them a lot and I would just quickly like to apologise that they are not clean. 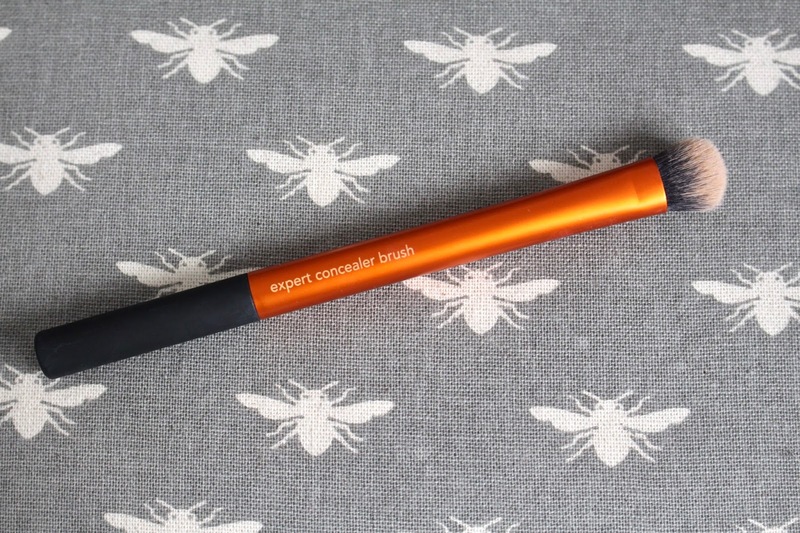 Talking of concealer & Real Techniques I've been loving the RT Contour Brush. 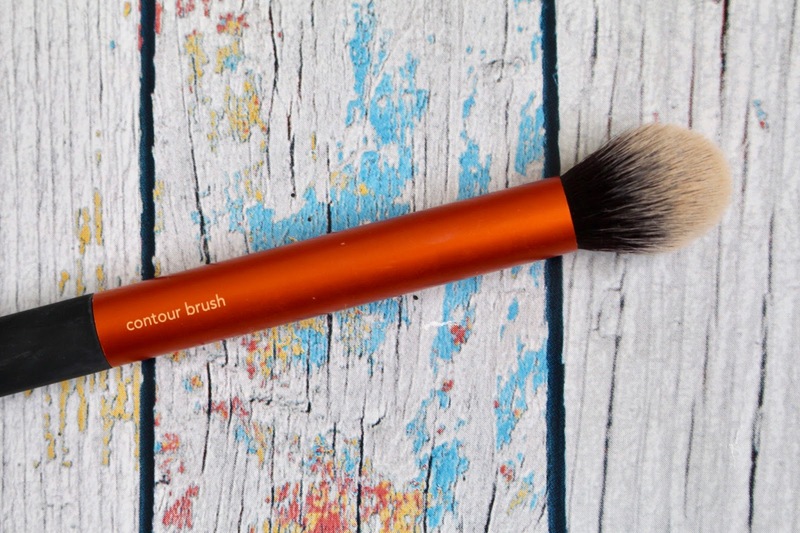 Believe it or not I don't actually use this brush for contour but for blending in my concealer either underneath my eyes or on spots, I use this first to blend and then gently dab a tiny RT beauty blender sponge on top just to make sure everything is blended and crease free. I'm one of these girls that just doesn't use some brushes for what they are meant to be used for. For example the RT Blush Brush I use for bronzer ect. Real Techniques make the best brushes especially for the highstreet. 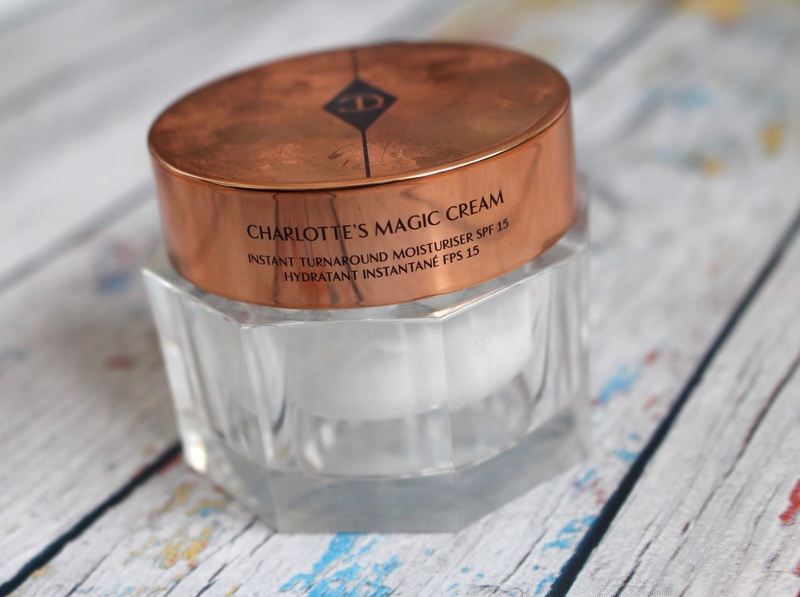 Charlotte Tilbury's Magic Cream, I did a review of this a really long time ago which you can read here and I've just finished another pot, this is one of my favourite moisturisers as it's perfect at giving dry skin a good hydration boost and makes my skin look overall much more healthier and refreshed, It makes a great base before applying makeup and for me I've found my makeup to last longer and look more fresh, this pot has lasted me about 2 months and a bit and as you can see I'm scrapping the barrel to get the last bit of that Magic Cream. Is it worth the hype? 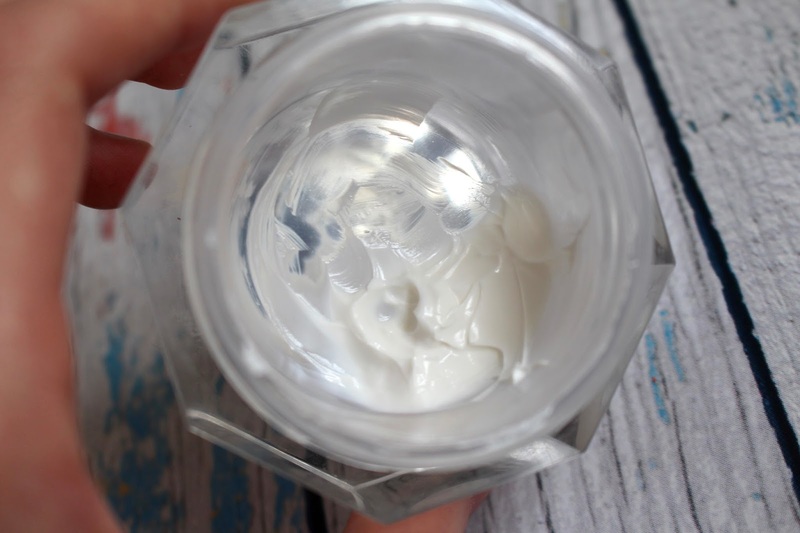 Yes it most certainly is if you have dry skin or dehydrated skin then you'll love this, if you have slightly oily skin then you might want to use this ever so often and not on a day-to-day basis like I have been. The final thing I've been loving this month is the OGX Coconut Milk Shampoo I mentioned this in my Ombre Hair Care post and this shampoo is amazing it adds a healthy shine and makes my hair feel more hydrated and refreshed, I now have ombre ends and this has really been keeping my hair in tip top condition. It not only works well but it also smells incredible and feels amazing on the scalp. As you will know from a couple of posts back I recently got the ends of my very long hair done in an ombre, and as promised said I would share with you the products that I either use to maintain my ombre or products I use to style it on a day to day basis. All of these you can get on the highstreet either in Boots, Superdrug or Lush (yes I've always got to get lush in a blog post somewhere). 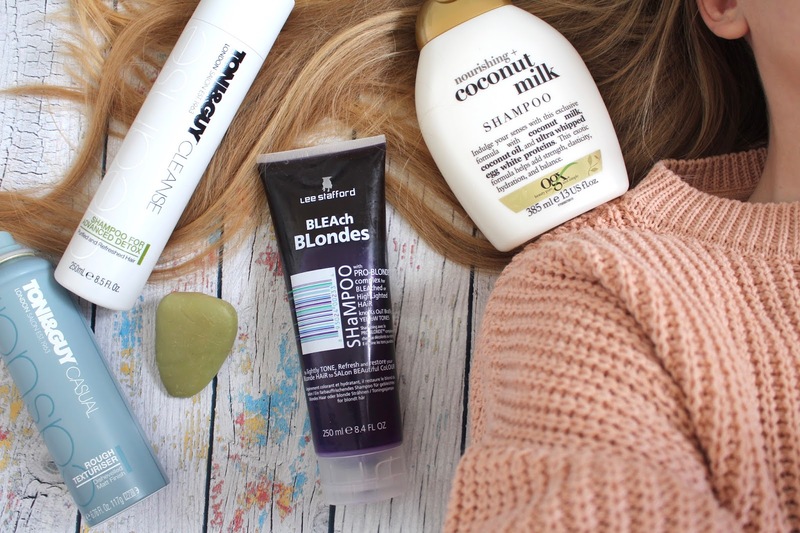 One shampoo that I've been loving for maintaining my blonde ends is the Lee Stafford Bleach Blondes Shampoo, I mentioned this briefly in a monthly favourites a while back and it's perfect at really enhancing my blonde tones and stops my hair having orangey tones. I love the smell and it's really good at making my hair look healthier. I've basically put peroxide on my hair which is not good but that has definitely my hair. Toni & Guy Advance Detox is another one that I've been loving it leaves my hair squeaky clean and fresh. Toni & Guy really are good for a lil bit more highstreet pricey shampoo they do really work for my hair and leave it feeling like it's been washed at a salon. A new edition to my shampoo collection is the OGX Nourishing Coconut Milk Shampoo, this is such a fantastic shampoo at adding that bit my hydration and nourishment to my whole hair, it again leaves my hair feel so much more refreshed and healthier, this one adds an incredible amount of shine too. 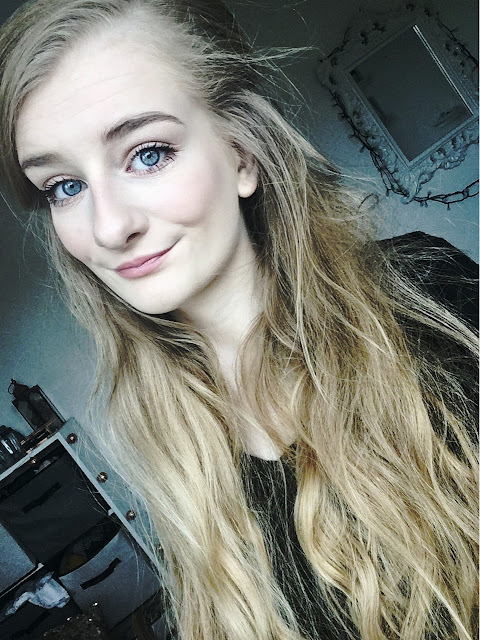 At the moment I've been using a lot the Toni & Guy Rough Texturiser Spray, this adds some va va voom to my hair and makes it look more swish and definitely adds more volume and texture, having long hair it can sometimes look a bit flat as it's long and heavy so this just gives my roots a lil pick me up and a boost, it's got a really good hold and doesn't feel like I can't not brush it out. I have been using this on second day hair as it just gives my hair that little refresh. That is everything that me & my hair are currently loving. 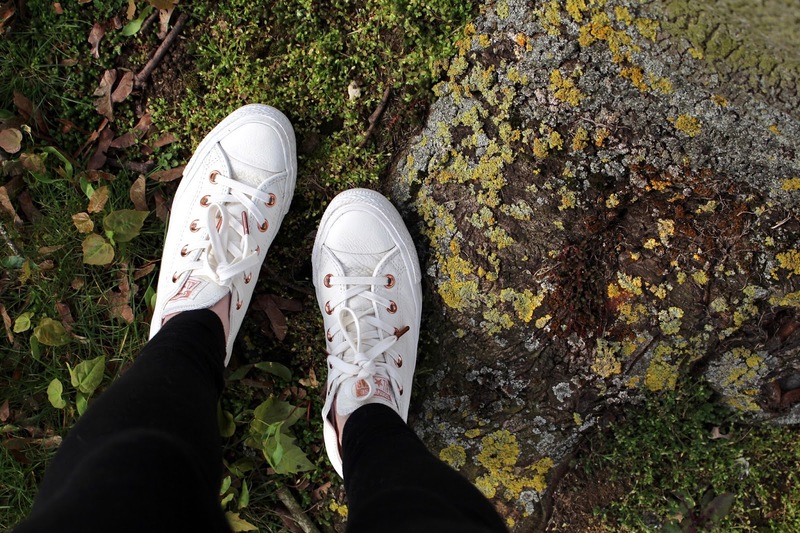 Converse are one brand that shoe wise tick every box for me, comfortable, sturdy & go with practically everything in my closet. So when I saw Converse & Office where going to do a rather instagram worthy collaboration in which they gave converse not only a pastel change up but rose gold detailing I had to get my hands on a pair of size 3s. Converse have created a whole array of all star lows in different pastel colours, from premium leather to super comfy and soft suedes. I picked up the All Star Low Leather Trainers in Egret Vapour Pink & they are beautiful. 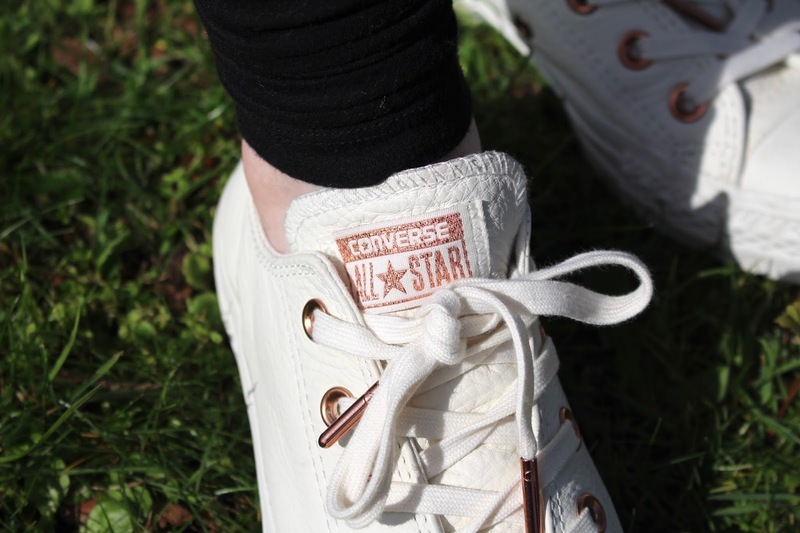 Everything from the rose gold detailing to the squeaky clean white leather, my favourite part about these converse is the back they have a stripe of a baby lilac/pink colour. 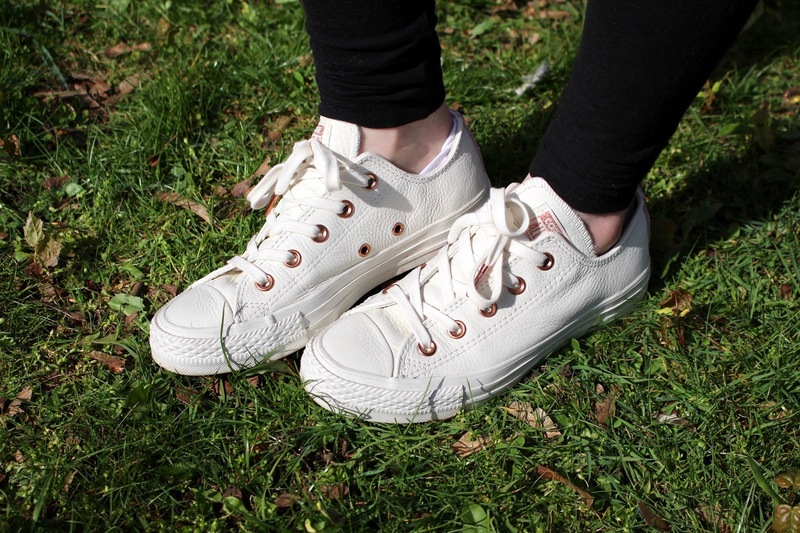 They are very comfortable & are exclusive to Office, if you are like me and are an avid converse fan then you most certainly need a pair of these LE ones in your life. I can already tell that I shall be wearing these a lot through this Spring & Summer. Don't you just love getting a new pair of shoes?